Edge, for the iPhone and iPod Touch, may remind you of Marble Madness with its otherdimensional motifs and tactile controls. But is it more than just pushing around a cube where spheres once rolled? Controls: In Edge, you control a block that moves about its gridded environment by "rolling" on its edges in the four cardinal directions. Picking up multicolored prisms increases your rolling pace. You can hang on the edges of your environment by rolling partly up and then holding your position, rocking back and fourth. The time you spend "on the edge" is subtracted from your level time. You accomplish this by means of three controls - with a finger-drag motion that's a little difficult to pick up at first, by tilting the iPhone, or by touching an onscreen directional pad. Touch-dragging is the default mode, and you'll probably want a protective screen (mine developed a split and a bubble before Edge arrived, and so I removed it). With oily fingers and a smudgy screen, the touch-drag-hold control can be slow to respond. The accelerometer would be the most difficult option. It does have a calibration and sensitivity feature, but as is the problem with most iPhone games, you're still moving the screen. But for those who want to see every level through to the end, regardless of the time or score they earn (some can take 10 minutes) the touch pad is there. And with 40 levels, it is a long lasting experience regardless of how you approach it. Cubism: Those who loved Crystal Castles and Marble Madness will adore Edge's high-contrast geometric plane of existence. It's one of the best imagined games for this new platform, and would still be outstanding in a straight port to a larger console. The levels you play are so deep and enriching you forget they are formed of, literally, building blocks. One early stage, "Metro" really got my attention for how well it interpreted a subway stop at night. Soundtrack: So excellent it deserves its own specific mention. This is the best soundtrack of any iPhone game, period. The electronica mix is pensive, soothing, energetic, mysterious - in short, perfectly matched to the tone of your current soundings. The chiptones for the level "8-Bit", in particular, will bring a smile to your face. I even found myself, before going to bed, just starting up Edge and listening to its opening-screen music. You can download the entire 19 track score for free from Mobigame (donation suggested), but it really should be experienced inside the game. My only disappointment is that, for gamers less skilled with the accelerometer or touch modes, the onscreen D-pad can feel like a cop-out. This is unfortunate but necessary because on some later levels (I played all 40) I simply couldn't see how they can be completed using touch or tilt. Granted, I was reviewing the game to its completion, and not taking my with it the way many casual gamers would. 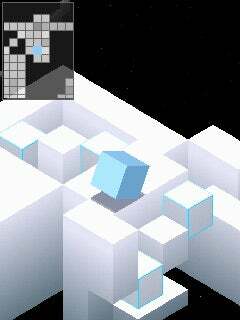 Despite all that, Edge is a must have game, moreso than any racer or puzzler out there. So much of the iPhone's desirability is wrapped up in its design, and the simplicity and elegance of its interface. Likewise, Edge is a game with a very simple purpose, elegantly rendered, and altogether desirable. Edge, for the iPhone and iPod Touch, was developed and published by Mobigame. Currently available from iTunes store for $4.99. Completed all 40 standard levels on iPhone (three more are unlockable) testing all methods of control.